Professor Everett Fox claims to have provided the world with a ‘new translation’ of Moses’ writings. Called The Five Books of Moses (with introduction, commentary and notes), it claims to pay attention to the fact that the Hebrew Bible was ‘meant to be read aloud’, and consequently a translation needs to pay ‘attention to rhythm and sound’. However, this unfortunate (mis)translation distorts the text of Genesis in several ways. For example, it translates as English poetry that which was never poetry in the Hebrew. This fosters the popular theological myth that Genesis is ‘only poetry’, implying that it is not really history. The first verse begins: ‘At the beginning of God’s creating of the heavens and the earth …’ thus subtly allowing for the evolutionary idea that a lengthy process was involved in creation. Reviewed in The Australian, 29–30 March 1997. Evolutionary astronomers claim that ‘normal stars like the sun evolve over millions or billions of years’. Yet now there is direct observation that shows that stars can dramatically change in a very short time. A team of astronomers including Bengt Gustafsson at McDonald Observatory in Texas and Martin Asplund of the Uppsala Observatory in Sweden have observed a star called Sakurai’s Object in the constellation of Sagittarius. In only a few years, the star has changed from a white dwarf star about the size of earth to a bright yellow supergiant 80 times wider than the sun. This means the diameter has increased by a factor of 8,000, and the volume by a factor of over 500,000 million. The astronomers expressed great surprise at the rapidity at which this change had occurred. New Scientist 154(2085):17, 7 June 1997; referring to Astronomy & Astrophysics 321:L17, 1997. If this had not been observed to happen, evolutionists would have undoubtedly claimed that millions of years were necessary. We should remember they have never actually observed stars taking millions of years to change (degenerate). We should trust God who was there and has revealed that the universe is much younger. Green light for amber bacteria? While some scientists are casting doubt on the many reports of ancient DNA being extracted from amber (fossil tree resin), a scientific team led by Raul Cano of the California Polytechnic is confident that it has an even more staggering result, namely live bacteria revived from amber. Since their first report in 1995, the team now claims to have no less than 3,500 types of micro-organisms, from dormant spores in amber allegedly 25 to 35 million years old. Some of them are similar, but not identical, to modern types and have never before been described. The team claims to be meticulous in trying to avoid contamination with modern microbes. Scientist Lewis Lambert, from a biotechnology company which helped verify the methods, is convinced they came from the ancient amber. He says, ‘You look down the microscope and see live microdinosaurs’. New Scientist 154(2082):7, 17 May 1997. If these really did come from the amber, how can it be millions of years old? Even in ideal, dehydrated conditions, the complicated machinery of life should fall apart in less than 10,000 years—see Nature 365:700, 1993. Leading creation theorist, physicist Dr Russell Humphreys, is elated at the magnetic data from the four largest moons of Jupiter. Ganymede, Io, and Europa all have cores—and all have magnetic fields, whereas Callisto, which doesn’t have a proper core, has no magnetic field. Europa’s magnetic dipole is tilted ‘a huge 80 degrees away from its spin axis’.1 A recent evolutionary report on these magnetic findings2 admits that this is unlikely if the field has been generated by a ‘core dynamo’; this is the way long-agers try to explain why the earth still has a magnetic field despite a measured steady decay, after their alleged billions of years. All this new data is quite consistent with the predictions of Dr Humphreys’ 1984 theory on planetary magnetic fields,3 as were the strengths of the fields of Uranus and Neptune, which he accurately predicted (in contrast to evolutionary expectations, which were very different). D. R. Humphreys, Internet post 27 May 1997. Science, p. 1239, 23 May 1997. 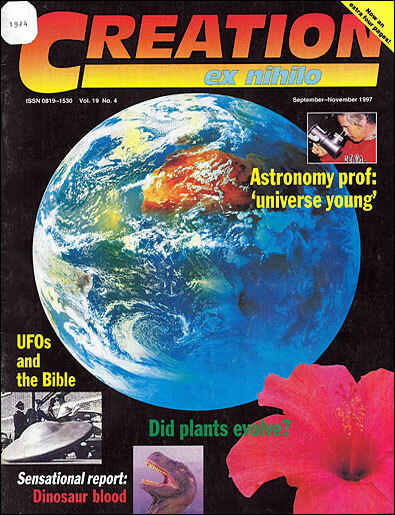 Creation Research Society Quarterly 21:140–149, December 1984. The Tyrannosaurus rex fossil from South Dakota, named Sue, suffered from gout, a painful joint-inflaming disease which also afflicts humans, according to X-rays of the skeleton. In this condition, excess uric acid in the blood forms crystals in the joints which can give rise to extremely painful inflammation. Newsweek, p. 63, 2 June 1997. Fossils show signs of many diseases also found in humans—e.g. abscesses, parasites and cancer. Christians who insist on millions of years for the fossil record are saying that such diseases predate the sin of Adam (the Curse before the Fall). Deeply blue about chess defeat? The world’s greatest human chess player, Gary Kasparov, was recently narrowly beaten in a six game match by a computer named ‘Deep Blue’. The result surprised most chess experts, who thought Kasparov was playing well below form. An editorial in New Scientist points out that it is really not unusual for a machine to do better than a human at a highly skilled task. Calculators, for example, can perform arithmetic much faster. Deep Blue was programmed (by humans) to be able to search very rapidly through the consequences of a huge number of possible moves and countermoves. But the computer ‘does not understand chess, learn from its mistakes, nor know why it did what it did. Deep Blue does not function like a human brain’. Nor can it exercise real judgment. New Scientist 154(2082):3, 17 May 1997. Creationists have long pointed out that natural selection helps living things adapt to new environments—by sorting (culling from) the built-in genetic variation.1 This is not ‘evolution, since it adds no new genetic information, as ameba-to-man evolution would require. Differing species of lizards of the genus Anolis, like Darwin’s finches in the Galapagos, have almost certainly adapted in this way to varying conditions on many different islands,2 perhaps even beginning from one pair. Such a mechanism is important in a creationist understanding of earth history. Noah’s ark presumably did not contain dingoes, coyotes and wolves; the genetic information in one ‘dog’ pair was sufficient for these to arise afterwards (therefore no evolution, because no new information is involved). C. Wieland, Variation, Information and the Created Kind, CEN Technical Journal 5(1):42–47, 1991. C. Wieland, Latin Lizards: Logos vs Lottery, CEN Technical Journal 10(2):170, 1996. Nature 387:15–16, 70–73, 1 May 1997. Ironically, uninformed evolutionist science writers have thought this was a Darwinian triumph, despite no new genetic information arising! The evidence that those early people who used stone technology were never ‘less-evolved primitives’ continues to accumulate. We have reported musical instruments with jazz/blues notes, intricate artwork, and aerodynamic throwing weapons. Sydney Telegraph, 23 May 1997, p. 28. To do this repeatedly, in such a way that the patient survives, requires considerable sophistication. Skulls are known, of later date, with similar evidences of repeated procedures, possibly done to try to cure epilepsy. One hapless individual’s skull had so many holes, it was said to resemble a ‘wiffle ball’. Australian scientists, relying on the ‘molecular clock’ idea, have thrown more confusion into human evolutionary ideas with a claim that humans diverged from chimps much more recently than was thought. In this scheme, Australopithecus afarensis (e.g. the famous Lucy) was also the ancestor of chimps. But since they believe that A. afarensis walked upright (they ignore recent evidence from CAT scans of the organ of balance that it did not), then that would mean that early chimps walked upright. Which, according to Simon Easteal of the Australian National University, would mean that ‘we didn’t come down out of the trees—they went up into the trees’. In this scheme, other australopithecines become progressively less upright to give rise to various apes. New Scientist 153(2075):18, 29 March 1997.